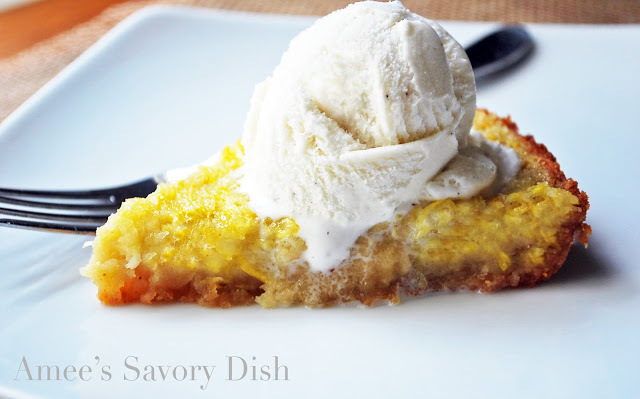 Summer squash pie a gluten-free dessert, full of flavor and not too heavy. Perfect for a lighter dessert on a warm, summer evening. Summer squash pie is made with one of my favorite summer vegetables, yellow squash. I’ve included the link for the crust in the recipe, below. Make sure you use the butter version of the recipe (not the coconut oil). It’s delicious with the buttery filling! Enjoy this summer squash pie recipe! Preheat oven to 350 degrees. Combine all ingredients in a large bowl with a wooden spoon until well blended. Pour into prepared pie crusts and bake 40 minutes or until lightly golden on top. Cool slightly and serve warm. It’s amazing with a small scoop of vanilla ice cream or frozen yogurt on top! 2 baked and cooled Coconut Almond Pie Crusts use butter instead of coconut oil for best flavor! Combine all ingredients in a large bowl with a wooden spoon until well blended. Pour into prepared pie crusts and bake 40 minutes or until lightly golden on top. Cool slightly and serve warm. It’s amazing with a small scoop of vanilla ice cream or frozen yogurt on top! I’ve had sweet potato pie and pumpkin pie – but never squash pie! Looks delicious!